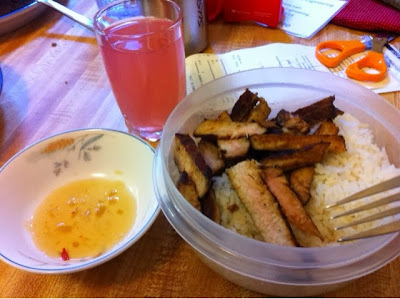 Anyway, for lunch, I had a very protein heavy meal: rice and soy-sauce marinated pork chop. But that protein did me well! I did not feel hungry at all until now: 7:15PM. I did have tea along the way. But I don't think that's significant. 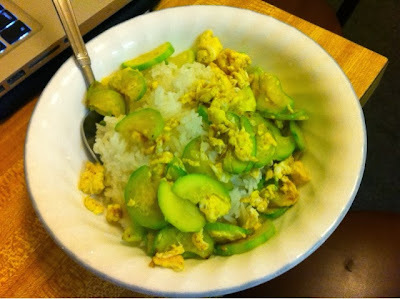 And for dinner, I thought I balance my day out with zucchini scrambled in eggs. This is one of my go to meals. My family, or maybe just me, enjoys scrambling our vegetable melons (cucumber, zucchini, etc.) with eggs. I like it; It was good.